climate change is threatening the 22,000 polar bears that are surviving across the world. A recently released report from the World Wide Fund for Nature (wwf) states that the threat originates from the loss of summer sea ice in the Arctic. What is more terrible is that this scenario is set to worsen in the future. Polar bears need sea ice to launch hunting expeditions for ringed seals, their primary prey. But longer ice-free periods restrict the time they can hunt each year. "As sea ice is being reduced in the Arctic, the polar bear's basis for survival is being threatened," says Lynn Rosentrater, co-author of the report. "Due to the loss of the sea ice, by the end of the summer the polar bears become very skinny. We've seen in places like the Hudson Bay in Canada that their ability to successfully raise a litter is being jeopardised," added Rosentrater. 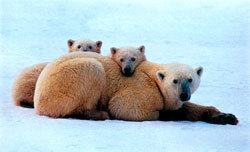 About 60 per cent of the world's polar bears live in Canada, the rest in Alaska, Russia, Norway and Greenland. The Intergovernmental Panel on Climate Change (ipcc) predicts that climate change in the polar regions will be greater than anywhere else on Earth. Arctic temperatures have risen by 5C over the past 100 years. The extent of annual sea ice has decreased by six per cent over the past 20 years. The sea ice decrease over the next 50 years is predicted to be 60 per cent. In the wake of such findings, the wwf is calling on governments to back the Kyoto Protocol. However, many countries are deferring from doing so, including Canada. "As one of the few homes of this magnificent animal, Canada's recent opposition to the Kyoto Protocol is unacceptable," says Ute Collier, head of the wwf-uk's climate change programme (see p9).